Redstar Equipment presents the DCW-450S Arc Welders, as part of their wide range of arc welders for pipelines and other welding methods, including strick, tig, mig flux-cored and gouging. The DCW-450S Arc Welders features a high-capacity generator of 20kVA/60 Hz and a low rmp, high output diesel engine of 1,500/1,800 min-1. 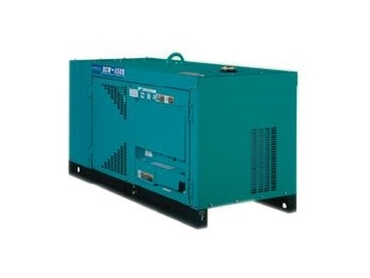 The generators include a voltage regulation within +/-1.0%. The diesel engine can be operated at low speeds, which can help increase the life of the arc welders. High quality AC power can also be used while welding tasks are being performed. The DCW-450S Arc Welders are available from Redstar Equipment and are designed to operate in virtually all locations. The arc welders can withstand very hot to cold climates and are the ideal dependable source of power and high quality welding tasks.